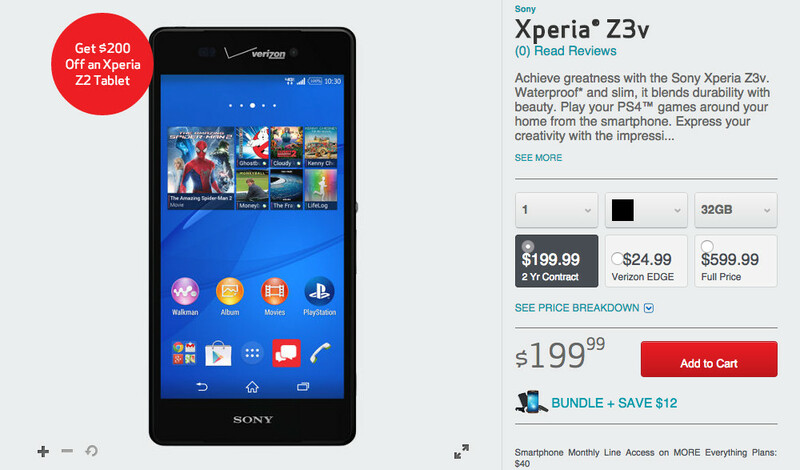 Sony’s latest flagship has officially reached US soil – the Xperia Z3v is now available from Verizon for $199 on-contract, $24.99 with Edge, or $599 at full retail. The device features a 5.2-inch FHD display, 3,200mAh battery, 20.7MP camera, 32GB internal storage, micro SD support up to 128GB, a 2.5GHz Snapdragon 801 processor, and wireless charging. The phone runs Android 4.4 “KitKat” and comes in either black or white. This is easily Sony’s most impressive smartphone yet, with industry leading battery life, a much-improved display over previous efforts, on-screen navigation buttons, and a guarantee from Sony that it will receive Android 5.0 “Lollipop.” If you have been waiting patiently for Sony to arrive in the US with a current flagship, this is one you should be excited about. Planning to pick up the Z3v?